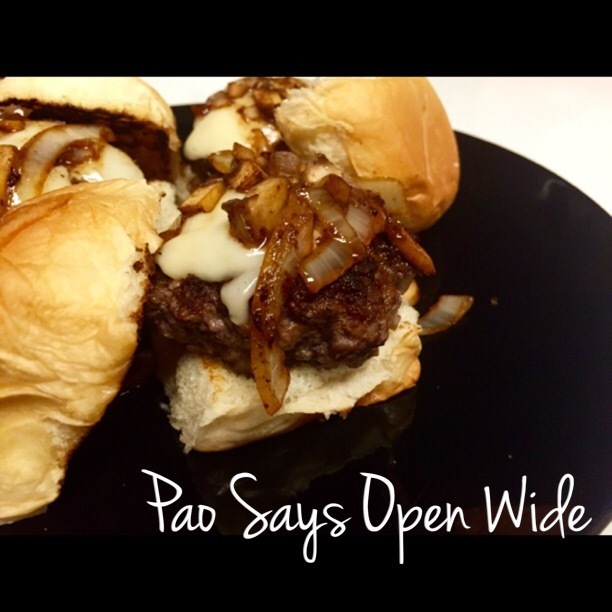 Bitty Bites: Truffled Sliders with Caramelized Onions and Mushrooms – Pao Says, "Open Wide!" Since our trip to Hawaii, Ryan and I have been pretty obsessed with Hawaiian Bread rolls. Being that we now always have a package lying around, I thought I’d incorporate them into dinner, and not just as a side item. The ground beef in the freezer helped me make the delicious decision: sliders. Since the rolls are sweet (and buttery and toasted), they provided a nice contrast to the juicy, cheesy, decadent burger bites. The hint of truffle in the burger and the onion and mushroom topping also contributed a smokiness and earthiness you wouldn’t expect in such a small bite. These are easy, quick, and simple to make. Combine the ground beef, diced onion, minced garlic, soy sauce, salt, pepper, and truffle oil. 1 lb of beef should yield about 9 slider patties, just smaller than the size of the palm of your hand… Unless you’re an NBA player or something, in which case, the burgers would be much smaller than the palm of your hand. Slightly press the center of the sliders in with your thumb (this will prevent them from becoming round little balls when cooked). Cook the patties (about 3 minutes to a side) and set them on a plate. Break the Swiss cheese slices up into pieces of appropriate size for the sliders and cover the plate (I used a pan lid). This will allow the cheese to melt into the patties as you cook up the mushrooms and onions to top them. Drain the excess oil from the pan and toss in the sliced onions and the mushrooms. As the onions begin to turn translucent, pour the white wine (or stock) into the pan to deglaze, along with a few drops of truffle oil. Let the sauce reduce a bit and then turn off the heat. Halve, butter, and toast the Hawaiian bread rolls. Finally, assemble your sliders! Top your patties with the mushroom and onion sauce. The drippings from the little burgers and the juices from the mushroom and onion sauce soak into the toasted rolls and create the bombest sliders you’ve ever had.